Well, to be accurate a brewery was built on the site of the later Anglo-Bavarian in 1864, in Shepton Mallet, Somerset, by a firm called Cox, Morriss and Co: in October that year the workmen digging out the spot where the copper was to go discovered the remains of a Roman pottery. It did not last long. In December 1870 the Bristol Mercury announced that the premises of the Shepton Mallet Pale Ale Brewery would be put up for auction on Friday January 13, 1871. It looks as if nobody bought the brewery at the auction, for on March 11 1871 the Mercury was reporting that “the extensive premises lately occupied as a pale ale brewery” in Shepton Mallet were being considered as a site for a barracks for the militia. By November 8 1871, however, the Hampshire Advertiser was announcing that the Anglo-Bavarian Brewery Company of Southampton had “recently purchased the new buildings in Shepton Mallet known as the Pale Ale Brewery, and are taking active steps to get their arrangements complete as early as possible … it is expected that by Christmas it will be in good working order.” The Advertiser expressed regret that the Anglo-Bavarian would be leaving the district: for the firm, which was run by a brewer called William Garton, had been brewing for at least a couple of years in Southampton, on a system using a form of invert sugar he had invented and which he called saccharum. Garton’s methods were designed to make ales “which possess all the essential properties of the highest class ales of Bavaria and Burton-on-Trent”. It brewed English ales, not Bavarian lagers, however. An ad for its “Anglo-Bavarian Ales” from the Hampshire Telegraph and Sussex Chronicle on March 27 1869 showed it was selling India Pale Ale, mild and strong ales, and amber ale. However, it had outgrown its Southampton site, where Garton also made saccharum for sale to other brewers, and acquired the Shepton Mallet premises to expand. Garton’s obituary in the Journal of the Institute of Brewing in 1905 says that he and his brother Charles, who was a brewer first in Bath and then in Bristol, invented not only the idea of using invert sugar but also the idea of treating brewing waters to give them the necessary chemical elements for whatever type of beer was being brewed, and also the “dropping” system of cleansing ales. He appears to be rather an unsung hero in British brewing history, and it is ironic that he is best known for something he didn’t do: for at no time in its history did the Anglo-Bavarian make lager. ‘The first Lager Beer Brewery erected in the United Kingdom’ – OK? What was the first purpose-built lager brewery in Britain? That would be the similarly-named Austro-Bavarian Lager Beer and Crystal Ice Company, in Tottenham, North London. The Austro-Bavarian Brewery, situated between Tottenham High Road and Portland Road, close to the junction with Pelham Road, opened in 1881, using proper bottom-fermenting brewing methods. There is very little known about the Austro-Bavarian: the man behind its was evidently called Leopold Seckendorff, but we don’t know how he raised money to build what, judging by an illustration from 1884, was a fair-sized operation (though the size that brewers made their buildings appear in their advertising materials and the size they really were are seldom the same). The British Library claims, on what evidence I don’t know, that it was staffed entirely with immigrant German-speakers and their English-born families, and it seems to have been backed solely with German capital. It had its own 450ft borehole for brewing water. We know that the brewery made four types of beer, in 1884, at least: Tottenham Lager, Tottenham Bock, Tottenham Munich and Tottenham Pilsen. The last two would be dark and light lagers respectively: my guess is that the first was a Vienna-style, solely because that’s the one well-known (at the time) sort not otherwise mentioned. Each kind cost three shillings and sixpence for a dozen pint bottles, when the standard take-home price for British beer was two shillings and sixpence a dozen bottles. Damned by this faint praise, perhaps, the Austro-Bavarian brewery was forced to reform as the Tottenham Lager Beer Brewery in 1886. 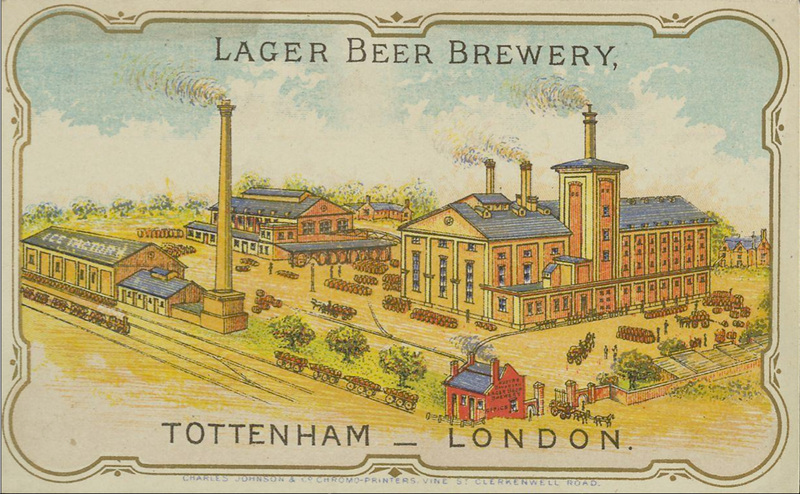 Baedeker’s Guide to London in 1894 reported that “English-made Lager-beer is supplied in the Tottenham Lager Beer Hall, 395 Strand,” brewed, clearly, by the Tottenham brewery. An analysis that appears in the Journal of the Society of Chemical Industry in June 1897 showed Tottenham Lager Beer at 4.52 per cent alcohol (by weight, probably), its Pilsener at 4.3 per cent and its Munich Beer at 4.92 per cent: “real” Munich lager, the Journal found, was between 3.7 and 3.93 per cent, generally, and Vienna lager was 3.89 per cent. However, in 1895 the brewery collapsed into liquidation, tens of thousands of pounds in debt. It rose again in February 1896 as the Imperial Lager Brewery, but closed finally in 1903. All the same, an operation called the Imperial Cold Stores Co seems to have run on the site until the 1980s, a last echo of Britain’s first purpose-built lager brewery. Don’t make the mistake, however, of thinking that the Austro-Bavarian, while the first purpose-built lager brewery in Britain, was the first brewer of lager in Britain. It was beaten to the pull by almost 50 years. But I’ll repeat that story another time. Interesting stuff, but I have no copyright on “pongy ale” It’s standard modern English and has superseded the term “real ale”. We (the humble scribes at Aleheads.com) are thoroughly entranced by the depth and breadth of research you bring to bear in your writing. Thanks for fighting the good fight as you try to shine a light into the increasingly murky world of beer history. And yes, I fully recognize that bloggers like us are partly to blame for said murkiness. What can I say? Accuracy and beer blogging don’t always go hand in hand. At least there will always be a wealth of misconceptions for you to expose with your brilliant blog. In regards to British Lagers…what do you currently consider the finest in the Realm? Any that we would have easy access to Stateside? “Pongy ale” is an in-joke on Cooking lager’s blog, where the pretensions of cask ale fans are rightly held up for regular ridicule. I don’t get to try British “boutique” lagers (if I can use that term as a contrast to mass-market ones) often enough to say which are the best, and I don’t think many, if any, are available in the US: Schiehallion, from Scotland, might be. Asking LOBI is probably your best move. The history-telling will continue: it’s fun, I enjoy it, and I’d do it if nobody was reading. I watched the demolition of the rather magnificent buildings at Tottenham from my office window in the 1980’s. The last to go were huge rounded cellars with walls many bricks thick, that must have been the cold stores. The legend ‘Tottenham Lager Beer and Ice Company’ was still visible on the wall facing North. And did you take photographs? I am a research assistant at the University of Saskatchewan working on a project called London’s Ghost Acres. We are trying to create a wiki for some of the major industrial sites in London. One of the critical pieces of information we are looking for regards the uses of land and how they changed hands over the years. From what I’ve been able to research, this site produced beer until 1903, but was used as a cold storage facility until the 1980s. If you would be willing to help, it would be extremely helpful if you could please tell me if you remember the year the buildings were demolished, and whether or not the cold storage company built new buildings on the site, or whether they were simply using the old brewery buildings. This way, we can understand how a single industrial site used the same buildings for different purposes. Any other information you would be willing to share would be very helpful.